In a forest in Belgium, not 45 kilometers from the border of Holland, stands an enormous stockpile of poison gas out in the open, rusting, and barely guarded. The stockpile grows every day. An accident here would have unimaginable consequences. It is spring in the Houthulst woods. Birds sing in the trees, rabbits hop over the path. It's a lovely picture that doesn't go with images of spitting, suffocating, and dying soldiers. The high trees don't stand far from the place where in the afternoon of April 22, 1915 soldiers were attacked with poison gas for the first time in history. It was Germans who had thought up these weapons. When the greenish-yellow cloud blew away, five thousand allied soldiers lay blue and dead in their trenches and there were ten thousand disabled for life. The trees of Houthulst conceal even more. Hidden among the budding greenery is an open space with ten concrete platforms, each surrounded by a low earthen wall. There they lie, piled up on wooden pallets, and sometimes just lying on the ground: tens, hundreds, thousands of shells, still filled with deadly chlorine, mustard, and phosphate gas. Eighteen thousand duds from the First World War. Three hundred thousand kilos. Sufficient for the eradication of millions of people. And every day, more is added. Most of the gas shells are heavily rusted. Some have partly burst open. Dozens of shells are leaking. Those have been temporarily encased in a container. We ask Commander Philippe Pille (picture right) why these things aren't stashed away safely in concrete bunkers. His answer is upsettingly simple: "We don't have any bunkers." Poison gas is a particularly frightful legacy of the First World War. Only Belgium and France are affected, since the Western Front lay in these countries: a ribbon of trenches from which the Germans and the Allies attacked one other over and over for four years. Altogether 1,500,000,000 shells were shot. Thirty percent did not explode. In West Flanders around the city of Ypres, the front was turned into a muddy wasteland. "The mud was so soft that falling shells met insufficient resistance to explode. The shells went completely through the puddles like it was butter. Blup! And the greasy clay closed in above them," Pille says. 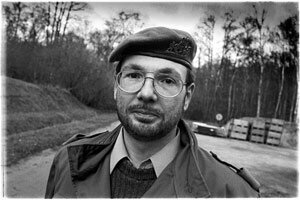 He is the head of Explosives Clearance and Destruction and a Belgian military official. The number of live shells that now-80 years after the date-are still found daily, is not declining. Quite the contrary: 72 mine removers work at it daily, twice as many as ten years ago. Here in the area around Ypres 200,000 to 250,000 live shells rise to the surface each year. 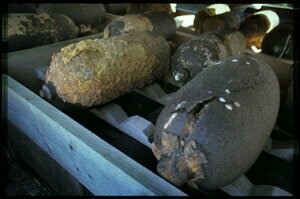 Pille euphemistically refers to 20,000 kilos of them as "problem munitions." They contain deadly gas. All these shells come to the surface due to the dynamics of working the ground. They are ploughed up by farmers or found by construction teams. Like in the village of Harelbeke, where construction workers dug up 78 poison gas shells. "People think that this stuff is no longer dangerous after all this time. Nothing could be further from the truth. The charge has become chemically unstable and therefore sensitive to shocks and friction. With some shells, there is only a little spring one millimeter thick that is restraining the pin. What do you think would happen if that spring were to rust through? Each year it deteriorates more." We walk along the platforms. The thousands of rusting shells and cylinders sure look innocent to the eye. But in a concentration of .085% in the air, chlorine gas leads to asphyxiation within several minutes. Phosphate gas is even more dangerous. And mustard gas affects not only the lungs but the skin. Mustard gas, named also Yperiet after Ypres, can make entire regions unliveable. Already in 1988, Pille's predecessor warned of the exposure of this munition to the elements (see picture right) in an interim report. 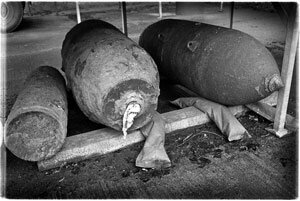 "The longer these munitions continue to be stored, the more they degenerate and it becomes even more dangerous to manipulate the munitions at a later stage." Pille points to a small monument. It is in memory of four mine removers who were the latest to die while they were working with German poison gas shells. "No one knows exactly what happened," Pille says. When the four were found they were already dead. There is a fence in the woods, but there is no guide path to be seen. "Where should we go?" Whoever wants to have a gas shell can usually find one from this point on. When farmers uncover such a shell while plowing, they often put it in a gap in a concrete telephone pole along the road. Anyone could take it." The effects of these hellish weapons are terrible. That was already apparent at the beginning of the poison-gas war. At that time there was no discussion of shells; the poison gas was released from large canisters. 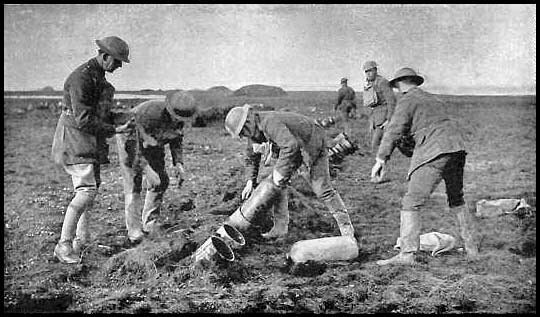 On the morning of April 22, 1915, Canadian soldiers in their trenches saw strange pipes sticking above the German breast-works. They did not understand what they were about to experience. They also did not see that below the breast-works, a total of 5,730 large gas canisters stood ready. 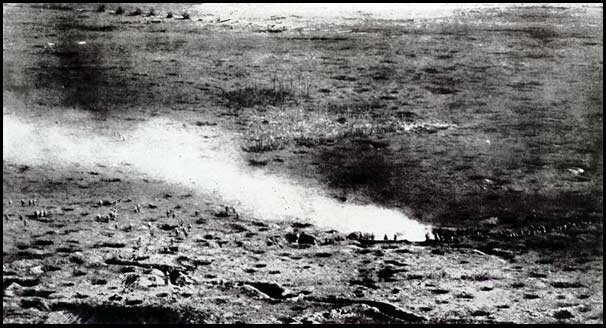 When at five o'clock in the afternoon, the wind turned and the Germans twisted the canisters open, 149,000 kilos of chlorine gas streamed over No-Man's Land in eight minutes, in the direction of the Allied trenches. "Our men were swallowed up by the mysterious cloud. At the same time, I felt its effect on my breathing. It burned in my throat. I felt a pain in my chest and could barely breathe any longer. I spit up blood and became dizzy. I thought I was lost." Around him, he heard screaming and crying from fear, coughing, and spitting. "Soldiers grabbed their throats with mortal fear, their eyes bulged out. Many ran into each other in the trenches. Others stumbled out in an attempt to escape the deadly cloud. Those who stayed behind in the trenches twisted in mortal fear, their faces blue, while they coughed blood from their tortured lungs." Several minutes later, thousands of German soldiers stormed out of the Houthulst woods where they had been hiding. Their faces were concealed behind small gauze and cotton masks. They walked closely behind the yellow-green cloud and killed anyone who had not yet suffocated. Now we are standing here with Commander Pille in that same Houthulst woods looking at those same German cylinders where again, on a daily basis and still full of gas, they rise up out of the ground. Pille shuts the gate as we begin to talk about the scientists who dreamed up this atrocity. It's a cruel fact of history that the five German scientists who were involved in the development of this gas each later received the Nobel Prize. It began with Professor Walter Nernst who experimented with shells filled with nitrate powder. The Germans shot 3,000 of these shells at British and British Indian troops South of Ypres, but they didn't even notice. Prof. Nernst received the 1920 Nobel Prize in chemistry for his research on thermodynamics. After Nernst's misadventure it was Dr. Fritz Haber's (picture on the right) turn, who immediately went to work on the development of chlorine gas. He was very succesful. He received his Nobel Prize in 1918, a month before the war was over. The Nobel Committee praised his synthesis of ammonia and hydrogen as the first industrial process in which gas forming products were made reactive on a large scale. But Haber hadn't done it alone. He had three clever fellows at the Kaiser Wilhelm Institute in Berlin on his team. Dr. Gustav Hertz and Dr. James Franck received their Nobel Prize for chemistry in 1925. That was the same year the Geneva Convention finally came into being that forbad the use of poison gas around the world. The fourth team member, Dr. Otto Hahn, didn't receive his Nobel Prize for chemistry until 1946, for atom-bomb research. Hahn made his name in 1938 from the first splitting of an atom. Fritz Haber was not able to join in these efforts since this "father of chemical war" fled to England in 1933. He was Jewish and didn't feel at home in Hitler's Germany. In that same England there were more than a 100,000 First World War veterans living with the consequences of his discovery. But this story has another side too. Commander Pille turns around and points to a very small round object, half-way in a shell, hardly a centimeter in length. "This looks like a normal British shell," he says. "But through this small hole, the British filled it with gas. The hole was sealed with a lead stopper. Finding that stopper under all that rust is now the only way for us to recognize them as gas-shells." The British struck back quickly at that point in the Great War. Exactly five months after the first German gas attack, the British opened their own gas cylinders during an attack at Loos, in Northern France. Because the wind changed direction, the gas was blown back over their own lines. Thereafter, the British developed projectiles that could carry the gas-bombs more than a kilometer. The next phase of the war saw the arrival of genuine gas-shells. In the end, the Allies became the masters of gas warfare over the Germans. According to the historical record, the British carried out 768 successful gas attacks. German figures are unknown, but they are probably only a fraction's difference. The woods hold even more surprises: a few hundred meters from the platforms of poison gas is a field where conventional shells that contain no chemical ingredients are rendered harmless. The battlefield must have looked just like this. Every day, except in freezing Winter, eight deep holes are dug twice a day. A wooden crate is lowered into each hole with 300 to 400 kilos of shells. A small charge of TNT is placed on them. The holes are covered with earth. At 11:45 am and at 4:30 pm, the sirens sound. Several seconds later, the munitions explode with a loud roar. The land is churned up as if a herd of elephants has run over it again and again. "For us, the First World War is still not over," Pille says. But you can't let gas-shells explode here. Earlier they were encased in concrete and dumped in the Gulf of Gascony in the south of the Bay of Biscay. In 1972, Belgium ratified the Oslo Accords that forbade this dumping. The Army stopped immediately. But the discovery of munitions continued of course. 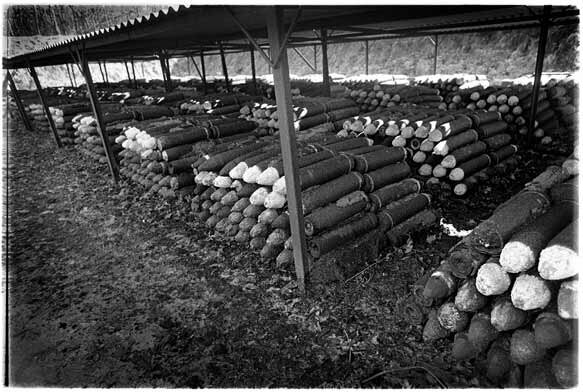 In 1980, there were still 225,000 kilos of poison gas shells lying piled up. Belgium appealed on the basis of the out-clause, Clause 9 of the Oslo Accords, that allows dumping "so long as the health of the people is not endangered." Once again-"for the last time"-poison gas was dumped into the sea. But because history began to repeat itself, Belgium built a "disinfection factory" a few years ago in the Houthulst woods that cost more than 10 million Euros (or US$10 million). The factory has an x-ray machine at its disposal to see through the shells in order to determine if a shell contains poison gas or a conventional charge. Next, robots clean the shells and bore holes in those with poison-gas. Then the gas is sucked out. A waste-works in Antwerp must burn the gas at a high temperature. All suspect shells must be X-rayed and emptied, piece by piece: all 18,000 that lie there now, plus what comes in daily. "And there aren't any less. We are going to be busy here for a long time," Pille fears. He tells about a war cemetery near here where suddenly the grass and plants died. Nothing would grow any longer. The area became larger and larger. "We started to dig and wouldn't you know it? A leaking gas shell." The walk through the woods comes to an end. On the path, between the piled up gas-shells, we almost trip over a dead rabbit, half rotted away. "Don't be frightened," Pille says hurriedly. "It died naturally from myxomatosis." Death Waits Patiently on a Belgian Beach.